This event has been postponed. We will let you know when a new date is confirmed. Local author, Lisa LaMonica, will sign copies of her latest book, Hudson, on Sunday, December 21 at 1pm at Spotty Dog Books & Ale, 440 Warren Street, Hudson. All proceeds from the book signing will benefit the Library’s History Room. The book is part of the Images of America series which chronicles the history of small towns and downtowns across the country. Each title features more than 200 vintage images, capturing often forgotten bygone times and bringing to life the people, places, and events that defined a community. 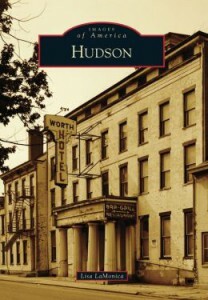 Book Description: Hudson, with its scarlet past, is still intriguing in many ways. It is the new go-to destination being discovered by tourists, chefs, world-famous artists and celebrities, motion pictures, and major magazines. Visitors say there is a palpable vibe of creative energy. Home to the largest number of self-employed people in New York, Hudson is a unique city where one can start their own business and not feel out of place. In vintage photographs, Hudson covers a rich history that includes the story of the Mohicans, whaling, and the multitude of factories in the Industrial Age, as well as the city’s modern-day transformation. Author Bio: Lisa LaMonica is an author and illustrator in upstate New York who has received awards for her artwork. She was nominated for Artist of the Year in 2002 by the Columbia County Council on the Arts. Lisa teaches art privately, at her local community college, and at the Hudson Youth Department. She has attended the Hudson Children’s Book Festival, the largest of its kind in the Northeast, every year since its inception. Many of this book’s images are from the Library of Congress, Historic Hudson, the Hudson Area Library History Room, and private contributors. This entry was posted in Fundraising, History Room, Programs and tagged book signing, history room, Hudson, lisa lamonica, Spotty Dog Book Books & Ale by Emily. Bookmark the permalink.